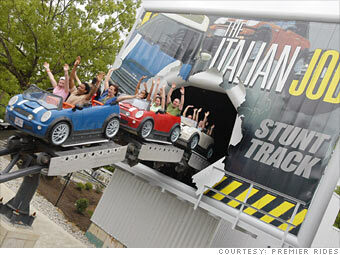 Locations: Kings Island, Cincinatti, Ohio; Kings Dominion, Doswell, Va.; Canada's Wonderland, Vaughan, Ont. "Hang on, lads; I've got a great idea." Those famous last words, spoken by Michael Caine at the end of the 1969 classic The Italian Job, may have touched a nerve with Seay when he was asked to build a ride based on the 2003 remake starring Mark Wahlberg. "The Italian Job: Stunt Track" carries its riders from one idea to the next, through explosions, fire, and even a helicopter attack, before a finale that plunges them into a small lake. One feature of which Seay is particularly proud is the ride's cars, which are scaled replicas of the Mini Cooper - sans roof, of course. It's the vehicle of choice in both movies. "We worked closely with BMW, the owners of Mini, to get the cars close to the actual dimensions of that vehicle," Seay says. "They even have working doors."